Bath and Shower Tiles Store - Ceramic Tiles for Walls and Bathroom Flooring, Delivered to Your Door Step! 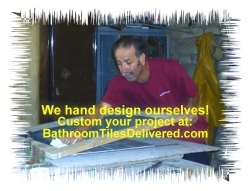 BathroomTilesDelivered is a website managed and promoted by MTZ Network. This website offers you a wide variety of accent ceramic tiles for your bathroom decor. The tiles are individually hand crafted in exotic Tunisia, Africa's Northernmost Cape, Southern Mediterranean country. The tiles are glazed and fired to resist scratches and severe temperatures. Different designs and colors are offered. The patterns for sale are authentic to different regions and countries of the Mediterranean. The colors and designs reflect the influence Tunisian Art has from neighboring countries such as Spain, Italy, Greece, and France. 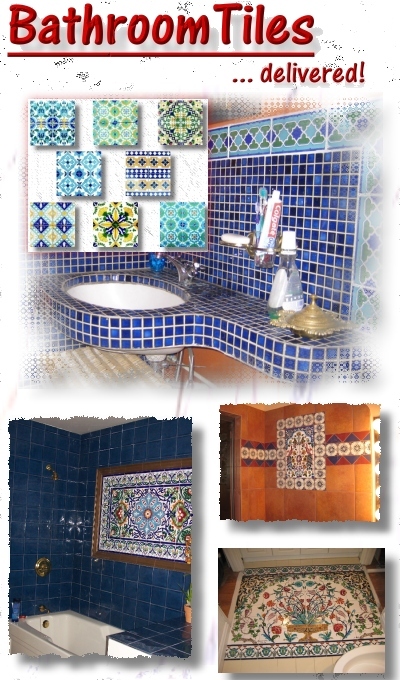 Ceramic tiles from Nabeul, for bathroom flooring, shower walls, and bath countertops. Nabeul, is where the tiles are handcrafted. Nabeul, (Neapolis, or New City) ancient battlefield for the Greek founded in the 5th Century AC and twin sister to an other Neapolis (Naples, Italy), is the Capital of the Ceramic in Tunisia. Thanks to its strategic location in the Central Coast of the Mediterranean and the diversity of its agricultural produces, Nabeul has known a massive flow of immigrants from all over the Mediterranean who brought with them a know-how in agriculture development as well as in manufacturing industries. Ceramics has been since considered for Mosques and Palaces Decor. Nabeul has know three major stages in its optimization of techniques and pottery production. In a first stage, Nabeul's pottery shown strong development signs following the influence of the Renaissance Movement, born in the neighboring Italy. Later on, Muslims chased from Andalusia, Spain (15th Century DC) after the conquest of Spain by the Catholics, found refuge in the Region of Nabeul and neighboring areas. The increasing number of tourists visiting the region has contributed to the growth of pottery production, soliciting artisans to come out with designs to meet the "European Tastes." Today, local authorities finance networks of schools to teach the art of pottery in order to boost supply, and support meeting the international demand for Mom and Pop factories. Nabeul's ceramics are mainly exported to Italy, Malta, France, Greece, Spain, UK., Germany, Belgium, Argentina, Australia, Canada ... and in recent years to the United States.